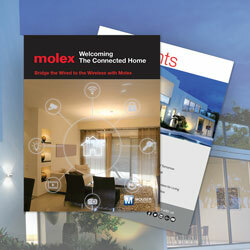 Mouser has published s a fascinating new eBook, ‘Welcoming the Connected Home’, in collaboration with Molex. In the new eBook, experts from Molex and Mouser research upcoming and future trends in home automation and strategies for designing IoT-enabled devices, as well as particular smart home solutions from Molex. The new eBook covers topics related to the connected home, examining both current strategies as well as future possibilities. Articles from the companies’ experts include advice on how to connect devices to the IoT, an investigation of upcoming abilities in intelligent integration, and a survey of products created to serve specific smart home applications. The company’s solutions help engineers create intelligent and integrated smart home systems with products comprising antennas, capacitive switches, cable assemblies, LED displays, wire-to-wire connectors, and USB type-C connectors. These products support a broad range of home automation applications and offer the wireless communication and connectivity necessary to support a comprehensive network of smart devices.